A little over a month ago I wrote about a new halal sandwich shop called Fresh East (read all about it here), which is a health-conscious deli that serves up Middle Eastern subs and shawarmas. This new sandwich shop is actually a new spin-off franchise from the very restaurant that I will be blogging about today, Paramount Fine Foods. Paramount Fine Foods is renowned in Toronto for its award-winning shawarma and assorted menu of healthy halal dishes. 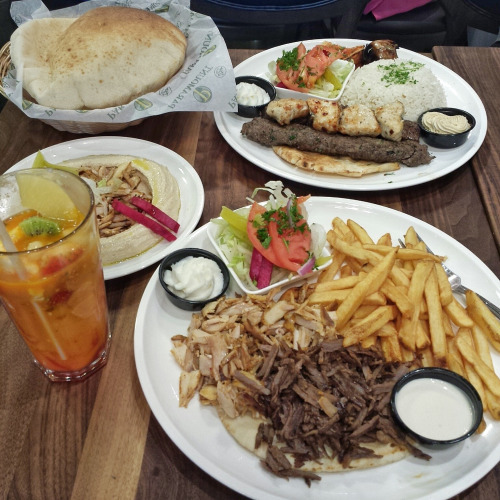 They are also Canada’s fastest growing halal Middle Eastern restaurant chain. The company sources only the freshest products for its authentic recipes and all of their restaurants have been certified halal by the ISNA Halal Certification Agency. Last month, Paramount Fine Foods opened its newest location by bringing exotic flavours of the Middle East to one of the most trendiest and most luxurious part of the city, Yorkville. Me and my guest were invited to its soft opening the weekend before it opened to the public where we were able to enjoy a set menu on the house. The free meals were a part of a soft launch charity initiative, allowing customers to enjoy the menu and were encouraged to tip generously. Paramount Fine Foods tallied the tips and matched each amount, donating all proceeds to the Jesse Ketchum Jr. & Sr. Public School; a culturally diverse, Yorkville institute. I’ve actually been to their Mississauga location in the past and much like many of their other locations across the city it has a very casual and laid back atmosphere. Once you enter the restaurant you would walk up to the counter and order off the menu hanging above the cashier, much like what you would do at any fast food joint. The cashier would then give you a number to bring back to your table and once the food was prepared, the servers would come find your number and bring you your food. As this new location is in Yorkville, filled with many high end shops and restaurants galore, the new location will feature an upscale sit-down dining experience with an open concept kitchen and a wood-burning oven unlike any of their other restaurants before. You will be greeted by a friendly hostess at the door when you walk in who will bring you to your table, and the wait staff will take your order and serve you your food and drinks where you are seated like what you would expect at any high end restaurant. This change in style will allow Paramount Fine Foods to cater to the high end clientele that will be in the area looking to grab a delicious bite to eat. Now off to the good part. The food and drinks! The new location in Yorkville is open right now on the corner of Bay Street and Cumberland. Paramount is the first full service halal restaurant in Yorkville so it definitely will be leaving a mark on its community, opening up tourism by catering to halal and health-conscious diners. If you are not near this Yorkville area, don’t worry as there are 15 other restaurant locations in Southern Ontario where at least 1 of them is bound to be close to where you live. However I will have to warn you, it may not be as pretty as this one.